Former President George H.W. 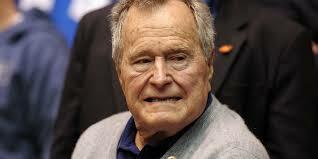 Bush,was hospitalized Thursday (today) after falling and breaking a bone in his neck. The former U.S President who at his current age of 91, is the oldest living former president, fell on Wednesday at his summer home in Kennebunkport. Spokesman for the former President Jim McGrath tweeted on Wednesday night. "His condition is stable — he is fine — but he'll be in a neck brace." Bush was being treated at Portland's Maine Medical Center, where a children's hospital is named for his wife. The medical center confirmed his condition was fair but said it was premature to speculate about when he'll be released. He has skydived on at least three of his birthdays since leaving the White House. He celebrated his 90th birthday by making a tandem parachute jump near his Kennebunkport home. He celebrated a low-key 91st birthday with his family there.